“Altars. Saviours. Rock ‘n’ roll. I braved my fear of spiders, dust plumes as thick as L.A. smog, and the stench of dog piss that the last owner of the house had let permeate the basement to tirelessly search my father’s record collection for my next holy grail. Emily Black was destined to be a rock star from the moment she was conceived. She had the name and grew up with the attitude, and she had music in her blood. When she was just four months old her mother left her and her father to follow the music and never returned. During Emily’s teenage years she embraced the music, going to every rock show she could at her local underground club and sleeping with rock stars. Emily soon came to the conclusion that sleeping with rock stars wasn’t the best option for her, she should become one herself and also, one day, the music might just lead her to the thing she strives for the most. Her mother. I honestly don’t think I can put my feelings towards I Wanna Be Your Joey Ramone into words, but I’ll try anyway. A unique, heartfelt book that follows the journey of one messed up girl and her even more messed up mother through the winding roads of rock and roll, this book is not one to be missed by any music lover. I was hooked the minute I read the title of this book and saw that fantastic, yet saddening cover. The image depicted on the front of this book pretty much sums a lot of it up, but that’s not necessarily a bad thing, the book is hard to read and breaks your heart a fair few times but its still worth it. The story follows Emily from the age of around ten, with a few flashbacks to even earlier times, and a few snippets of her mother, Louisa’s, life too. I loved that you got to see Louisa’s side of things because even though I didn’t like what she did and went on to do, I understood her more for it. I thought Joey Ramone was very unique because unlike most YA stories it focussed on Emily’s mother and father and what led to Emily being born and her mother leaving, it followed Louisa’s story and it wasn’t just focussed on a tiny bit of Emily’s life; it followed Emily until she was 23, not so much YA anymore. I am a massive music fan and I love combining my love of books and my love of music together in the way that reading a book about music does. I thought the references in Joey Ramone were brilliant, with bands like Nirvana and Social Distortion and venues I can only dream of mentioned and I loved that Reading Festival – a festival I have attended at its sister site in Leeds before – was name checked. Music and it’s importance was so focussed on that I couldn’t help but love this book, even if the writing did let it down on occasion. I could relate to so many things throughout this book when it came to music and drinking and guys and some of it kinda upset me, but most of it was fantastic. I think the book really did draw on the importance of living your own life for yourself, not for others and was pretty realistic in its portrayal of certain ways of life. I did occasionally feel like some of the references were forced and in all honesty Emily and Louisa can come across as so selfish you want to slap them, but I really enjoyed all of this book and think most music fans will. Read this, especially if you happen to be a tough-nut, music obsessed girl who has a soft spot when it comes to her daddy, like me and Emily. 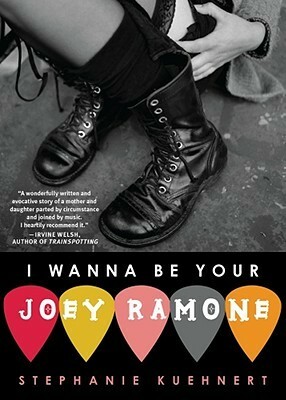 I Wanna Be Your Joey Rammone was published by Pocket Books and MTV Books in 2008 in the US. My copy was purchased online. Oh my god, I’ve had this book for YEARS (possibly!) and I still haven’t read it. I really must. I really want to read I Wanna Be Your Joey Ramone. I know a lot of bloggers sing the praises of Stephanie Kuehnert, so checking out her work is definitely a priority for me. Plus I’m a huge fan of music, so this one seems like it’ll be a win-win for me! Great review! I never heard of this book before, but it sounds amazing! I love books where music plays a huge part in the plot.